What is more decadent than a hot fudge sundae over a banana? Banana splits are some of the most loved ice cream creations around, and with this blend of flavors, you will be able to indulge in the taste of a Banana Split with your morning or evening cup of coffee. 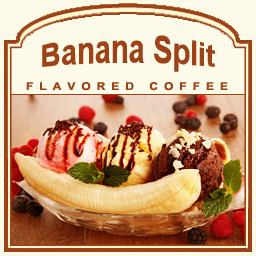 With flavors ranging from warm chocolate fudge to creamy French vanilla, hearty hazelnuts, sugary sweet cherries, and of course, bananas, this delicious Banana Split flavored coffee will make your taste buds crave dessert! With only 2 calories per cup of this Banana Split, you can indulge guilt free. Since 1904, Americans have been going wild for this special ice cream treat, but now you can enjoy it in your favorite coffee mug without the mess and the stickiness. Perfect to serve as an after-dinner dessert coffee, this Banana Split flavored coffee is the ultimate side to any dessert ranging from chocolate chip cookies to a banana split itself! If you are looking for an ice cream inspired coffee, this Banana Split flavored coffee is the ultimate treat and is made with 100% real Arabica beans. Deliciously thick with flavors that will surely make your mouth water, this Banana Split coffee will leave your taste buds wanting more. Whether you can't get enough of the chocolaty undertones or the sugary fruity sweetness, knows you'll go bananas for this Banana Split flavored coffee! Like all of our coffee, this Banana Split will be roasted and shipped on the same day.